RESA FANTASTISKT MYSTISK IS RETURNING! For the first time in 15 years, Burglars of Hamm will present their acclaimed production of this previously unknown masterpiece by Swedish playwright/provocateur Lars Mattsun (1849-1912). Through Mattsun’s surreal theatricality and stunning wordplay, the audience is engulfed in the tale of a troubled young man named Philip, who follows a Mysterious Child into a world of art, sexuality and madness. Much of the original cast and production team return, including controversial director Todd Merrill. 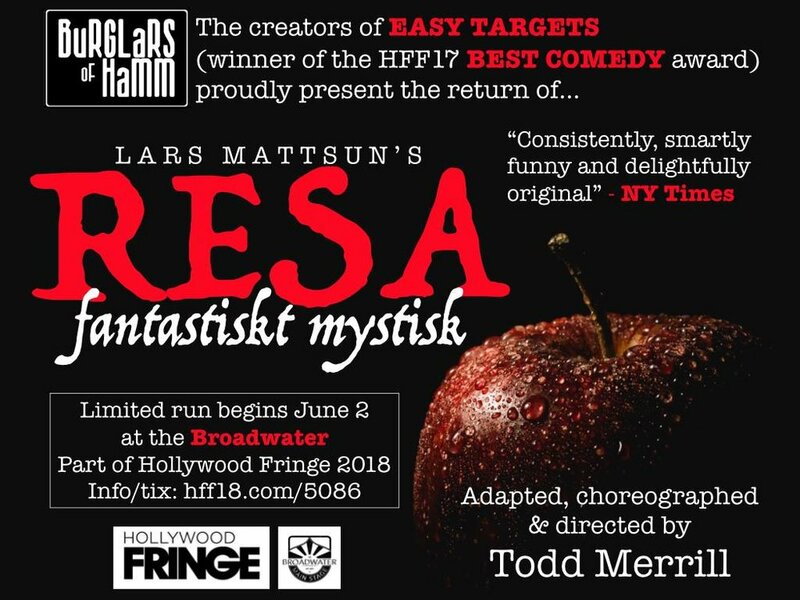 Resa has played to great acclaim in Los Angeles, Seattle, Edinburgh and New York, and the Burglars are excited to bring it back home as part of Hollywood Fringe Festival 2018. The winner of the 2017 Hollywood Fringe Best Comedy Award returns with four new pieces, including a world premier piece starring Hugo Armstrong. EASY TARGETS is for every audience member who has sat in the dark at a bad play thinking they now know what prison must be like. It allows the audience to act out the fantasy of punishing their jailers. A satire of one-person-shows, EASY TARGETS presents 4 short solo shows and then invites the audience to show their “appreciation” by pummeling the performers with rolled-up socks any time they feel bored, annoyed, patronized, manipulated, etc. Each audience of EASY TARGETS forms a pack working to remind the performers, writers and designers that if they fail to respect the audience, they will suffer the sock! Better Lemons - "One of the most fun evenings you will ever have at the theater... such a hoot"
This Stage LA - "So funny and so smart... gorgeous... relentlessly entertaining and beautifully performed." Gia On The Move - "The most fun you will have at Fringe... So creatively absurd is the comedy and so galvanizing is the writing, directing and performances... you may be in jeopardy of spending an entire pay day check on socks! Brilliant!" fringereview.com - "Brilliant comedic minds... razor-sharp... tight and astute performances... by golly, you just want to knock Clark Gable's hat off his dumb head"
ScopingLA - "Want to get that pent up aggression out of your system...? 'Easy Targets' at Sacred Fools is here for you... incredibly entertaining... these talented actors are eager to see what your pitching arm can deliver. Come at ’em!" Haunting - "Masterful blend of a one-person show, props, and audience participation... one of the best shows I’ve seen at Fringe to date"
The TVolution - "Absurd perfection... so dead-on funny... As far as 14 karat zaniness goes, this show was a Fort Knox"